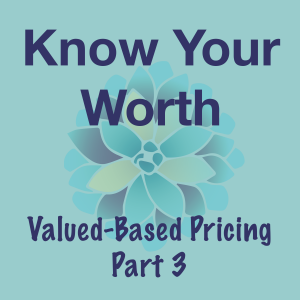 This is the third of a three-part blog series about value-based pricing for financial coaches. For the first part of this series, Ditch Your Hourly Rate, click here. For the second part, Determine Your Value, click here. Knowing your value is one thing. Selling your value is a whole other ball game. But one that deserves your attention and practice. If you’ve done the exercise in the second part of this series, you already know there is an immense value in the service you provide, one that has both an immediate impact and long-term benefits for your clients. Knowing those benefits will allow you to properly communicate them when the moment presents itself during your sales conversations. But how do you know when the moment is right? When I conduct Eureka sessions or have a 15-minute Q&A call, I let my clients do most of the talking. I am trying to learn as much about them as I can because once I know them, I can determine the best strategies to help them achieve their financial goals. But I also listen to them, knowing that I can better communicate my value if I know what particular values interest them. What are their financial goals? What are their main struggles? How do they feel about their money? The answers to these questions will help me more naturally talk about my values at the end of our discussion when I will pitch my coaching program. I gently open the door that way by asking if they would like to hear how I can help them. I don’t tell them how I can help them. I ask first because the truth is not everyone is ready to dive in at that point. It’s possible that with the strategies I’ve provided them during the Eureka session that they’ve been given enough tools to try to work on things on their own. And if they say no, then I honor that. This isn’t the time for a full court press to try to make a sale. That is a sure fire way to make these conversations awkward. You want them to feel natural. If they say yes, that is when I will talk about the benefits of working with me and the value I provide. But I am particular in which values I talk about. I don’t need to run down a list of everything I can do. I only talk about the values I provide that pertain to that particular client. For example, if I’m talking to a single person, there’s no reason to bring up that working with me helps my clients better communicate with their spouse about finances. That benefit won’t resonate with them, even if they plan to get married someday. It is only once they have shown an interest in learning how I can help them achieve their financial goals that I talk about my coaching programs and the details of working with me. And if they’re still interested after we go over the details of the program, and that’s when we talk pricing. If I’ve correctly communicated my value, by that point they are usually ready to become financial coaching clients. Pricing conversations don’t have to be scary. If you clearly understand your value, you can confidently state your price, knowing you are worth every penny. I have seen lives transformed over my 10 years as a financial coach. My clients have paid off debt they assumed they’d have for years longer. They have opened their dream businesses. They have dramatically improved their relationships with their significant others. These are not small things. These are the things that make life worth living and as a financial coach, you have the ability to help your clients transform their lives too. Know your value. Be confident in your pricing. You’re not helping someone for an hour: You are giving them the skills to create a better life. And that, my friend, is truly priceless. Want to know more? We teach pricing and payments and sales conversations that work during week five of the Financial Coach Academy. If you’re just starting out as a financial coach or thinking about starting a career in financial coaching, the academy is the course we created to help people start and run a successful financial coaching business. We’ve taken everything we know about running a successful business and turned it into a 10-week online course. You can learn more about the academy (we offer both a live and e-course version) here.